Jorge may love his bidet but I love, when time allows, to enjoy an occasional tub soak which he doesn’t understand. It was one of those weeks working around the clock without knowledge of time of day unless reminded by the church bells. She informed me that she would place in my tub her contraption with some nice bath salts and bubble bath-relaxers before she departed for the evening. As usual, after cooking and serving I joined my fascinating guests at the table for a drink and stimulating conversation that as usual might continue into the early morning hours. Joe, a Californian new arrival, jet-lagged and tired, decided to call it a night around 2 AM. As he started up the stairs to his room, he yelled out to all of us at the table. “Something funny is going on. I must be dreaming, jet lagged or drunk.” As we all rushed to the stairwell, we were greeted by 6 feet high clouds of vanilla scented perfumed bubbles descending the stairs, having exited from the open bathroom door to my room. Julie was right, it works wonders, especially if you leave the motor running for 2 hours in a tub of water with many ounces of perfumed bubbles. 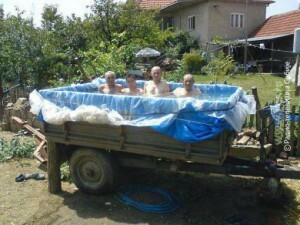 An Italian-American, Candido Enzo Jacuzzi in 1949 invented the jacuzzi. When one of his sons was born with rheumatoid arthritis his doctor recommended hydrotherapy for pain relief. Being that hydrotherapeutic therapy was only available in communal tubs at the time led Mr Jacuzzi to invent a jacuzzi whirlpool to be used in his private home designed to lessen the pain of his 15 month old son. The family continued with other related inventions leading to some 50 patents. In spite of the fact that this Italian-invention spread around the world, when I came to the farm in Tuscany in the early 80’s it was little known as an outdoor spa for relaxation, Making many phone calls and driving many miles in my search led to various companies supplying hydromassage units for indoors. Nobody seem to understand how one could be used outdoors or after skiing in the snow. Times have changed. 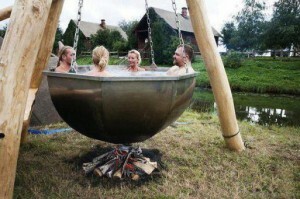 Gradually farms began to adopt modified jacuzzis, so one could enjoy them outdoors. Not what I was seeking at the time but actually very effective. Must inform our readers that we no longer have these units.